This guy was a nice/weird/odd encounter for the group while they explored the The Choking Tower. Taking inspiration from the original Planescape and 3e Omnimetal from MM3. My characters wanted to tame him. I left notes from Xoud indicating this was a successful experiment of his. Fire Form. The elemental can move through a space as narrow as 1 inch wide without squeezing. A creature that touches the elemental or hits it with a melee attack while with in 5 feet of it takes 5 (1d10) fire damage. In addition, the elemental can enter a hostile creature’s space and stop there. The first time it enters a creature’s space on a turn, that creature takes 5 (1d10) fire damage and catches fire; until someone takes an action to douse the fire, the creature takes 5 (1d10) fire damage at the start of each of its turns. Grappler. The aurmovorax has advantage on attack rolls against any creature grappled by it. Illumination. The elemental sheds bright light in in a 30-foot radius and dim light in an additional 30 feet. Keen Smell. The aurumvorax has advantage on Wisdom (Perception) checks that rely on smell. Metal Eater. An Auromvorax can bypass an object or constructs damage resistance and immunities so long as they are made of metal. Paragon Hit Points. The creature has multiple pools of hit points, each of which is tracked separately. All damage and healing must be completely applied only to one pool of hit points. One pool of hit points must be completely reduced to zero hit points before any damage is applied to another pool. When a pool of hit points is reduced to zero, all on-going conditions and effects affecting the creature end immediately. After a pool of hit points has been reduced to zero, it cannot receive any healing until after a long rest. If all pools of hit points have been reduced to zero hit points, the creature is killed. Paragon Actions. The creature gains one complete turn in each combat round, including one reaction between each turn, for each pool of hit points it has above zero. When a pool of hit points has been reduced to zero, the creature loses one turn each round thereafter. Pounce. 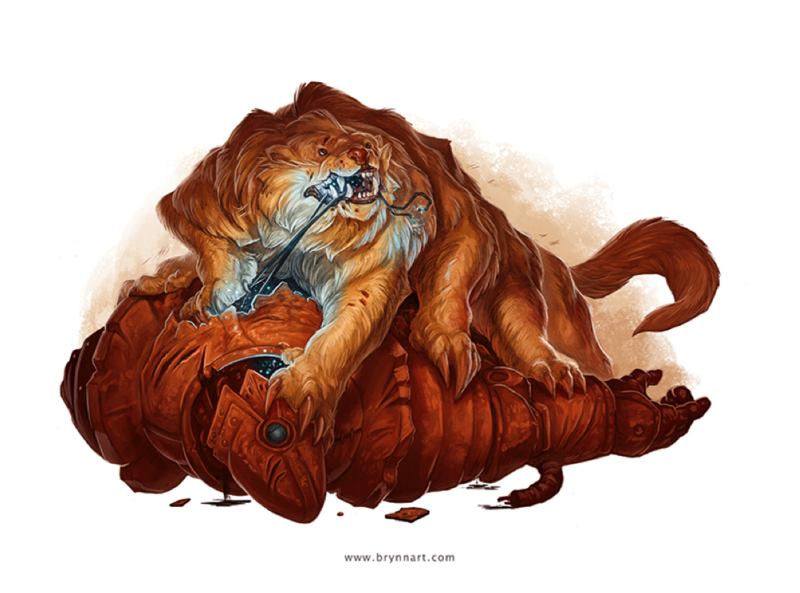 If the aurumvorax moves at least 20 feet straight toward a creature and then hits it with a claw attack on the same turn, that target must succeed on a DC 16 Strength saving throw or be knocked prone. If the target is prone, the tiger can make one bite attack against it as a bonus action. Multiattack. The aurmovorax makes three attacks: two with its claw and one with its bite. If available it may also make a cinder breath attack so long as it is not grappling. Hit: 10 (1d10 + 5) piercing damage on a hit the auromvorax grapples the target (DC 16 to escape). Ability checks made to escape this grapple have disadvantage. It also gains the rake attack option. Cinder Breath (Recharge 6). The ominmental exhales a 15-foot cone of smoldering ash. Each creature in that area must succeed on a DC 10 Dexterity saving throw or be blinded until the end of the omnimetal next turn. Death Birth. When an omnimetal reaches 0 hit points, it bursts into its component elemental parts, creating a smoke, fire and air elemental. The wispy spirit of the original animal can be seen momentarily before it departs for the Beastlands. Furkas created this creature with the merger of fire and air and melded with the life essence of an aurumvorax, this creature has all the strength and none of the weaknesses of all three creatures. Not as dangerous as the original omnimetals that inspired Furkas, still, a dangerous creature nonetheless.